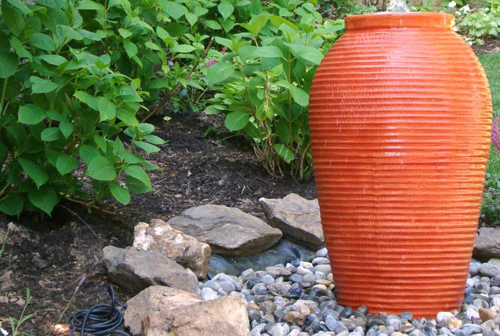 Turning garden pottery into water features for your home or garden areas are becoming very popular. The sound of moving water is both soothing and calming. Here are a few ideas to get you started. 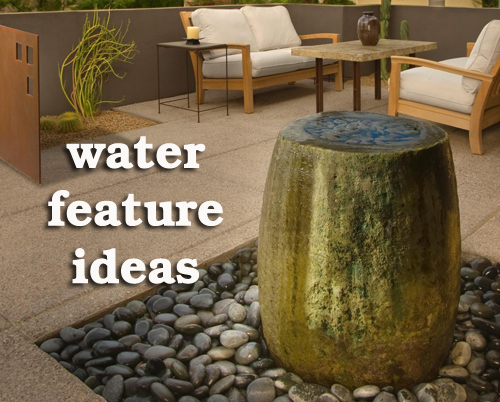 This water feature shown above, made from an garden pot adds a traditional touch to this contemporary outdoor space. Water spills over the edges of the pot onto a bed of beach pebbles, producing soothing white noise for relaxation. Design by Chad Robert. This Asian inspired garden two pots were used. The bottom one is sitting upside down with a garden bowl sitting on top. This is an easy way to hide the pump being used to move the water. Filling the top bowl with stone adds beauty and weight to keep the pot secure in windy weather. The koi is a nice addition. Here is a bold idea. 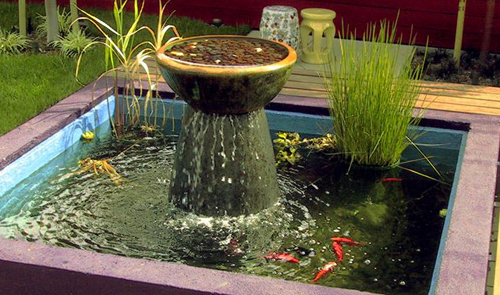 Don't hesitate to use bright bold colors for garden pots when designing a water feature. This is a large glazed planter that is high fired and will hold up well to the spilling water cascading down the sides. When everywhere you look is green, add a splash to color! Read more......Grow your own backyard drugstore.